Since SSEP began 2 years ago, we have periodically invited guest bloggers to write essays on what this program has meant to their communities. A list of these essays is found at the top of the In Our Own Words page, at the SSEP Community Network Hubsite. We recently invited SSEP attendees at Kennedy Space Center for the SpaceX launch of Dragon to write about their experience, and what it meant to students, teachers, families, and their community to have a student team’s microgravity experiment on this historic flight. I’ll soon write an essay and post it here as well about my own sense of those two early mornings to remember. Below is the first of these essays, written by Dr. Barrett Caldwell, the Director of the Indiana Space Grant Consortium, one of 22 State-based space grant lead institutions that have provided vital funding in support of communities participating in SSEP in their States. Indiana Space Grant has supported two SSEP flight opportunities for the Avicenna Academy Science Community Collaboration (AASCC) in Lake County, Indiana, first with SSEP on the final flight of Space Shuttle Atlantis (STS-135), which was also the final flight of the U.S. Space Shuttle program, and now on SSEP Mission 1 to ISS. 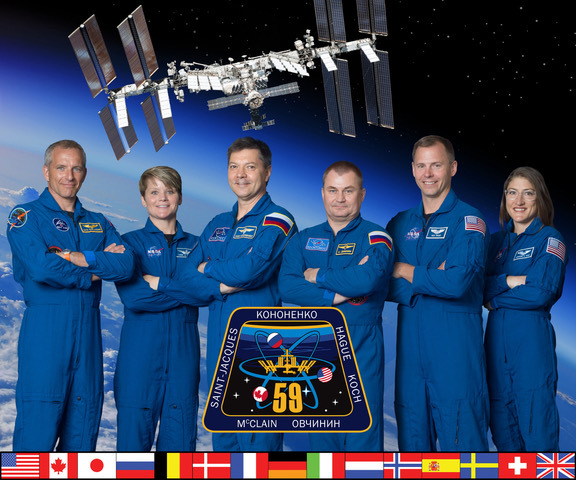 Amanda Arceo, the SSEP Community Program Director for the AASCC, which includes Avicenna Academy, Highland Christian School, and Forrest Ridge Academy, also wrote a wonderful essay on this blog, What does it mean to reach for the stars?” in May 2011, addressing their STS-135 experience. There were 27 SSEP students, teachers, and family members at Kennedy Space Center for the May 19, 2012, launch attempt of the SpaceX Falcon rocket, and a smaller but still determined group of 14 that returned for the successful launch on May 22, 2012. The experience we all had on May 19 was amazing, with the SSEP delegations invited by NASA to the Kennedy Space Center Press Site for interviews. The fact that both NASA Administrator Charles Bolden, and Kennedy Space Center Director, Bob Cabana, both former astronauts, came to the Press Site to specifically to meet the SSEP students, just added to the magic. Gwynne Shotwell, the President of SpaceX also went out of her way to meet the SSEP student researchers while en route to the official press conference on the launch abort. SpaceX then invited the SSEP delegations back to watch the May 22 launch from the VIP site right across from the Vehicle Assembly Building. And then … Dragon launched. Even in retrospect, it sounds unlikely… but it worked out this way. When I was first invited to the SpaceX Falcon / Dragon launch attempt on April 30, I was thrilled and excited. This was the third launch I’ve been invited to as the Director of the Indiana Space Grant Consortium. However, the Lake County, IN, SSEP experiments have been responsible for two of them: the Avicenna Academy experiment on STS-135, and now a larger community collaboration for this first commercial launch to the ISS. I quickly booked my tickets… and then watched the series of emails and news reports as SpaceX scrubbed that launch date. How about May 7? No, I couldn’t attend—my first job is as a Purdue Industrial Engineering professor, and grades were due the next day. That date slips by, as well. We’re now looking at early in the morning on May 19. Well, almost, but still not quite: I had already booked a ticket for Orlando, for my attendance at the Industrial and Systems Engineering Research Conference. That ticket was for Saturday morning, and expensive to change. I admitted defeat and put the NASA TV on my smartphone waiting for the countdown. 3..2..1.. Liftoff? Not this time. Gwynne Shotwell’s press conference was a marvel of poise and calm, and I was impressed. But there was a secret bit of guilty thrill. The next opportunity would be on May 22, and I would be there anyway! Jeff was great to respond to me when I explained, first thing Monday morning, that I could attend the launch, after all—if he still wanted to add me. I could understand that multiple launch attempts can either reduce or enhance the desire to have visitors, and so I gladly escaped the technical session to take his call. I found a car, took a nap, and found myself leaving the hotel at midnight, as other conference goers are finishing their evening at the banquet. I was surprised to see very little traffic anywhere along the highways. Of course, for the Shuttle launches, leaving Orlando only 3-4 hours before the launch could be a recipe for watching the fiery tower from somewhere on State Road 528. Better safe than sorry, though, and I was relieved to pull into the KSC Visitor Center parking lot an hour earlier than expected. That’s where I first met the student from Houston’s SSEP, and a few of the resilient folks from Highland Christian School who had managed to hang on and have a semblance of alertness at 2:00AM. These were the real stars of the launch for me, and in fact, some of the people I spent the most time talking to during this historic event. (There were, of course some other folks in the NASA / SpaceX invite group viewing area, including NASA Administrator Charles Bolden, Kennedy Space Center Director Robert Cabana, and commercial space habitation company founder Robert Bigelow. Not bad company for me, who studied space systems engineering and design of damping mechanisms for space structures as an undergrad, and mission operations task coordination as a faculty member.) 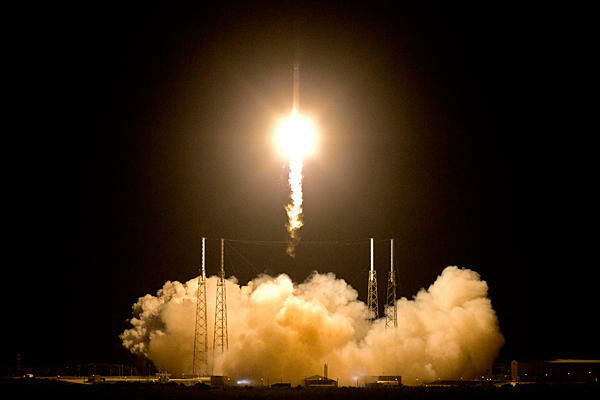 Watching the launch from the balcony across from the Vehicle Assembly building on a clear, moonless night was a glorious sight—a bright Falcon stretching her wings and leaving the Earth. As I spoke to the student experimenters, and the parents, I was stunned. Here are 12 and 13 year olds, learning about bioreactors and microgravity-based growth of livers, or the challenges of flight operations and project and team management. When I was 12, I was no less excited about spaceflight, and was eagerly involved in watching and learning about the space station experiments going on at the time (that was Skylab, and the Apollo-Soyuz program). What would it have been like if I had actually been able to design, build, and fly one of those experiments? These kids are certainly in the right place, at the right time. I had a secret lament that I couldn’t benefit from this experience in the ways that they were actively participating. I was, eventually, convinced that my participation was valuable too. INSGC did underwrite the Lake County collaboration at a critical time in their project. As a line from the Right Stuff points out (via Indiana astronaut, Gus Grissom), “No bucks, no Buck Rogers.” Inspiration for these young scientists, engineers, inventors and project leaders is essential. But so is investment. Elon Musk has made a lot of money, and has decided to use much of it to create and support SpaceX. Robert Bigelow has made a lot of money, and is committed to using much of it to create and support space habitation at Bigelow Aerospace. No, most of us don’t have a few hundred million dollars lying around. But each of us makes choices with the funds we do have. You don’t just wake up one morning and drive to Cocoa Beach and happen to see a rocket launch. Sometimes you get a little lucky… but most of is planning and investment and dedication and belief and commitment spanning months and years and even decades. That commitment is essential, or else success remains a thing of wish and hope and dream. I want to thank all of those at NCESSE and SSEP who allowed me to be at the right place at the right time. I’m glad I could be in attendance as a Space Grant partner. I am hoping, most of all, that others see what commitment and investment in our capabilities can do… and choose accordingly to help us and ours be where we need to be, and do what we need to do—now, not just someday.